Hi, This is my first post. I tried searching the forums for an answer before posting but couldn't find anything. Frankly, I'm not sure what to search for. 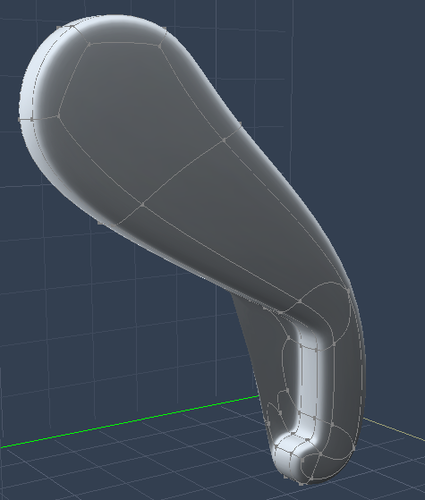 Anyway, I'm creating a shape in the vertex modeller and when I smooth it, the polygons kind of stretch out over the area where the geometry curves. I'm not sure how to fix this. A picture is worth a thousand words so here is what is happening. Anyone know how to fix this? Thanks! The broad face of the object appears to be a single polygon. Try linking some of the edge vertexes with the link tool. Particularly where it bends. I should add some stability to the mesh. Ah, Thanks. I'll give that a try. Thanks evilproducer! I've only done one side so far but that works perfectly. Glad I could help! I consider myself a bit of a novice in the VM, so I'm glad when I suggest something that works. In your first screen shot, the largest polygon(or face) of the object has what is called an N-Gon. An n-gon is a polygon with more than 4 sides. When you use smoothing on a mesh that has n-gon's, Carrara's modeler will(afaik) triangulate to the center of an n-gon. Depending on the shape of an n-gon, this triangulation may result in creating new polygons through or over other topology. To avoid some smoothing issues with n-gon's, you can triangulate them first. In the vertex modeler make selections and use Model->Triangulate Polygon, or Model->Triangulate n-gons(> 4 points). N-gons are fine for some models though, it just depends on what you need. Hope this helps. Not just Carrara, either. As tbwoq says, it's always good to remove nGons by linking vertices until you get four vertices per polygon. It is also good practice to try and make all polygons equal four vertices. This is very popular modeling and some of the pro figure modelers are really fast at not only building this way, but at recognizing when they equal anything but four. Smoothing (SubD) is one thing, but lighting is yet another concern. Some modelers use trigons instead, where each polygon has exactly three vertices. One of the functions that Carrara has is to convert quads (or higher) that are not flat into trigons. This is so that the light isn't messed up when a quad has one or more of its vertices laying on a different plane that the rest, making the actual polygon distort. Looks cool, though. Glad you finally had to post, so we can meet ya! You taking the mickey? You are an amazing vertex modeller and I have learned a lot from you! You do want to sell your new planned scene, yes? http://www.daz3d.com/forums/discussion/20965/P945 scroll down a few posts to see. Getting there EP??? I have been working on my abri...I have too many levels of extrustion for the scale of my cliff/rock/mountain/mesa item...got me into trouble, but I am very happy now at finishing off the top with a grid thanks to some private tutoring. Worked perfectly. To correct without maybe having to start over, I tried to decimate but I can only decimate a wee bit from top down or bottom up without getting an error message. Can't do in the middle either as I thought I was selecting too much in one go and thought to do in segments, like top, bottom then middle areas. (eg set to front view and select vertices). I definitely cannot select the whole thing without getting the same message: Error occurred when executing decimate or something like that. That's OK...will build a new one, practice is good! Thanks for all the help, you guys. I've started getting back into modelling lately after stopping for a while. Now that you bring it up, I remember the thing about non-planar polygons, 3 point ones vs. 4 point ones, etc. All that had slipped out of my head. Thanks for the reminder. I used to use Carrara way back when it was Ray Dream Studio (I think it was even called something before that) so it's cool to see that it's still going. I hope they keep going with development. I know Daz Studio is their big product, but I love the way Carrara works. It has been rejected. They're willing to look at it again, but I have more work to do to pass muster. Never mind that they never actually looked at the scene file. I've been working on it after work and on weekends for quite awhile. It's the only thing I've done in Carrara lately. Beware of decimation. Sometimes we can get too nuts and come up with an enormous amount of polygons, but often not directly from Carrara. You'll see more of that if you either use Zbrush, sculptris, 3D Coat, etc., although you can also do that using smooting and the displacement tools in the Carrara VM as well. But in Carrara (as with the others, too) we can control the amount of actual polygons vs what gets implied and rendered using SubD smoothing. Same goes with terrain fidelity. Crank up the fidelity and you can end up with a lot of polygons. Decimation can be a great way to reduce the poly count. 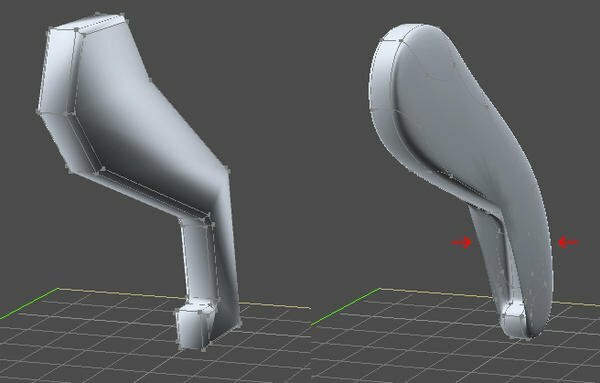 I have yet to be impressed with using this in Carrara on models with a lot of variations in shape due to an end result of individual points being left alone away from the main body, creating a point sticking out of the model. It can be an easy fix to drag that point into the model, but then you're losing what was out there to begin with. Decimate if you like - it's there to use. But I suggest saving a copy first, and testing the new decimated version next to the one before decimation. In many cases, Carrara can render your higher polygon count model rather quickly - depending upon lighting and other considerations. I used to use Carrara way back when it was Ray Dream Studio (I think it was even called something before that) so it's cool to see that it's still going. I hope they keep going with development. I know Daz Studio is their big product, but I love the way Carrara works.I agree. I am currently trying to make products for Carrara that can help DAZ customers see more of Carrara's potential, while giving Carrara users a good handful of new presets to play with - in the hopes that the increase in sales will give Carrara software development more funding. It won't be rejected for long. The product is enormously awesome! Everyone will want this thing in their library - to be sure. It's that fraking cool! Stuff gets rejected every day for this reason or that. Just listen to any advice They may have given, make the necessary changes and try again. It's so cool without any changes, that its bound to get accepted one of these times.